Hi All first post on here. I've been an avid Aurora fisherman for some time actually all fish particularly Trout Splake, Lake, Brook. I have quite a bit of success with the Auroras to date Amazing Fish. In my first year I caught what I believe might have challenged for the World Record was clost to 23 inches and was about 16 inch girth sadly I did not weigh it have a look at the pic yourself Big Male is the fish I am referring to. Very cool man. I would love to get one--just for catch and release. There's one lake nearby with them (fittingly named Borealis Lake) but it's only open every fifth year. by the American Fisheries Society. I don't know exactly how the legislation works in this case, but aurora trout are hatchery raised and stocked into several lakes, to be fished recreationally every few years on a rotating basis. The lakes are closed to all fishing in the off-years. There are only two lakes to which aurora trout are native, and the natural population was destroyed by acid rain, fortunately with some specimens already having been collected for hatchery breeding. 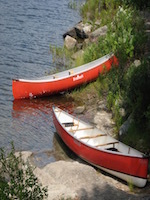 The original aurora trout lakes were eventually treated with lime and gradually re-stocked with the hatchery-born descendants of their original inhabitants. These two lakes, if I'm not mistaken, are permanently closed to all fishing. All this to say that although I can't point you to the legal mechanism that makes this possible, this is a carefully managed put-grow-take system and no one here is poaching. Well technically he's over his possession limit, but we can assume one belongs to the cameraman. Beauty fish TheBigJay13. I spent a lot of money and time chasing the elusive Aurora's and in fact I think I've camped right in the spot the pic was taken. As far as the record goes, obviously it's not possible to tell from pics but I've seen pics of the record and it was FAT. Looked like a finned football but it was also being held by a 7 year old and little kids seem to make fish look huge.